When you are visiting Mt. Vernon, be sure to see the following attractions. Jones Memorial Chapel hosts the Lawrence County Historical Society Museum alongside the Historic Adamson Cabin. The museum and cabin are open from 1:00 p.m. to 4:00 p.m. on Sundays from Memorial Day weekend through October and by appointment. 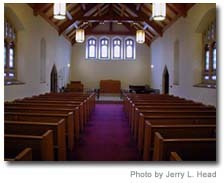 You can rent this local landmark for your meeting, wedding or other special event. Built in 1962 and dedicated in 1963 in memory of Lawrence County native Lawrence Jones' wife, Edna Withers Jones, and his mother, Katherine Payne Jones. Home of the LCHS Museum and Adamson Cabin. Located at 11110 Lawrence 1137, just off Highway 174, Mt. Vernon. Adjoins the Mt. Vernon Golf Course. For information about scheduling a wedding, meeting, or other special event, contact a member of the volunteer Jones Memorial Board, Kathy Fairchild (417-466-3076), or Gary Daughtrey (417-466-2893), lchs@mo-net.com or visit www.jonesmemorial.jimdo.com. Just a few minutes drive from Mt. Vernon is Talbot's Wildlife Reserve. Horse trails, walking trails and several ponds for fishing are just some of the attractions available. During hunting season it has an exceptional deer and turkey habitat for excellent hunting. Williams Creek Lake adjoins the Spirit of '76 Park and has handicap fishing dock, asphalt walkway around the pond, and handicap restrooms. 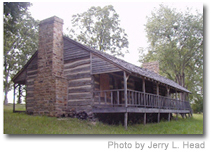 Admission is free to the historic Adamson Cabin and Lawrence County Historical Society Museum. They are located on the grounds of Jones Memorial at 11110 Lawrence 1137, adjoining the west side of Mt. Vernon Golf Course. The Adamson Cabin was built before the Civil War and was moved to this location. Volunteers have restored the dogtrot-style cabin. The museum features numerous displays on Lawrence County history. Among the highlights are an 1865 hearse and the original statue of Lady Justice, which was removed from the top of the Lawrence County Courthouse in 1994 and was used as a model for the statue that now sits atop the courthouse clock tower. Sections of the museum focus on the chronological history of the county, including its citizens' involvement in the Civil War, Spanish-American War, World War I and II, Korea, Vietnam, and Desert Storm. The "Hall of Time" also offers a glimpse of the '50s, '60s, and '70s, among other eras. One display highlights items common to this area during the Depression. The gift shop is open during museum hours, offering the Historical Society's complete collection of research publications and Lawrence County memorabilia. Included are indexed census records, tombstone inscriptions from every known cemetery in the county, marriage records, funeral home records, and other publications. Regular museum hours are 1 to 4:00 p.m. each Sunday, from Memorial Day weekend through the end of October. Tours and visits by appointment can be arranged by contacting museum chairman Kathy Fairchild (417-466-3076), or Gary Daughtrey (417-466-2893), lchs@mo-net.com. The museum is operated entirely by volunteers. If you are interested in becoming involved, contact Fairchild or contact the group through its Facebook page. Meetings of the Lawrence County Historical Society are held at Jones Memorial at 2 p.m. the third Sunday of January, March, May, July, September, and November. For more information, please call 417-466-2122 or e-mail at info@mtvernon-cityhall.org. All contents © 2003-2019 The City of Mt. Vernon, except where indicated otherwise. All rights reserved worldwide. Duplication or reprint only with express permission from The City of Mt. Vernon. All trademarks are property of their respective owners. This page was last updated on October 8, 2013.